Crazy for Love - Topper 44"x 44", runner 18" x 58". 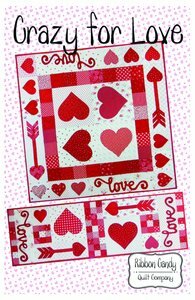 Make one or both quilts to add lots of love to you decor. Simple piecing and fusible web applique is used to make these fun holiday quilts. Templates are full size and detailed instructions help you get these done in no time.